I went to the cutest baby shower over the weekend. A friend of my husband’s from high school (turned my friend) had her baby shower this weekend. A neighbor and her daughter threw the showers. They had the cutest pumpkin decorations and some fabulous food. I am dieing to get her recipe for the “healthy” pumpkin donuts we had. I’m such a sucker for newborns, I can’t wait to meet her little boy or girl. This Fall has been perfect in Minnesota. Light jackets are a wardrobe staple for me right now. I am loving this Land’s End one I did a post on previously. Make sure to check out this coat. If you’re looking for a quilted jacket, this one is for you. Coats and rain boots seem to have always been fall favorites. 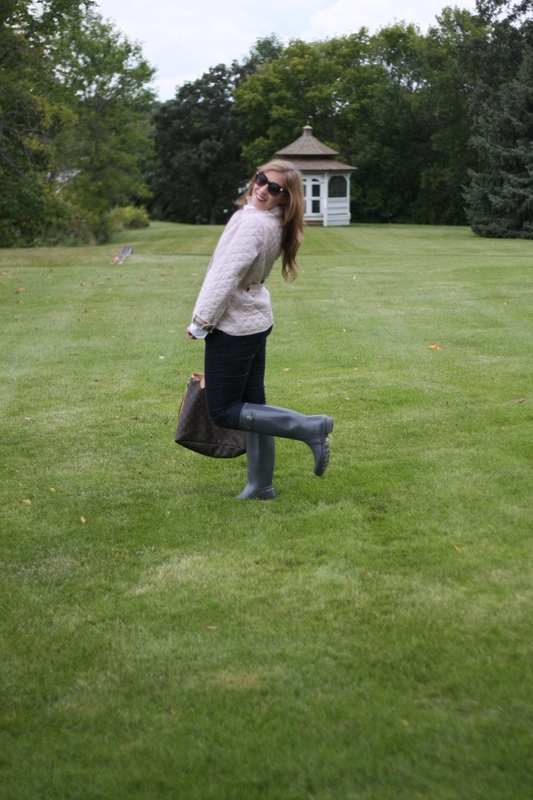 And yes, I wear my Hunter boots even when it’s not raining. Have a great day! I love your effortless, easy jacket! Very chic! You look really chic and casual at the same time I love the way you styled the jacket! This jacket is such a classic! I think it is time I invested in one! I love how you paired it with your Hunter boots! Burberry always makes the best things! Love this jacket! And with those Hunters… perfection! Adorable! In love with that coat! So perfect with the boots! Love that quilted jacket! I’m dying to start wearing jackets and boots. You cannot go wrong with Burberry! Love this simple look! I have that bag 🙂 Did you know its reversible 🙂 Anywho, love quilted jackets. I need to get one this year! 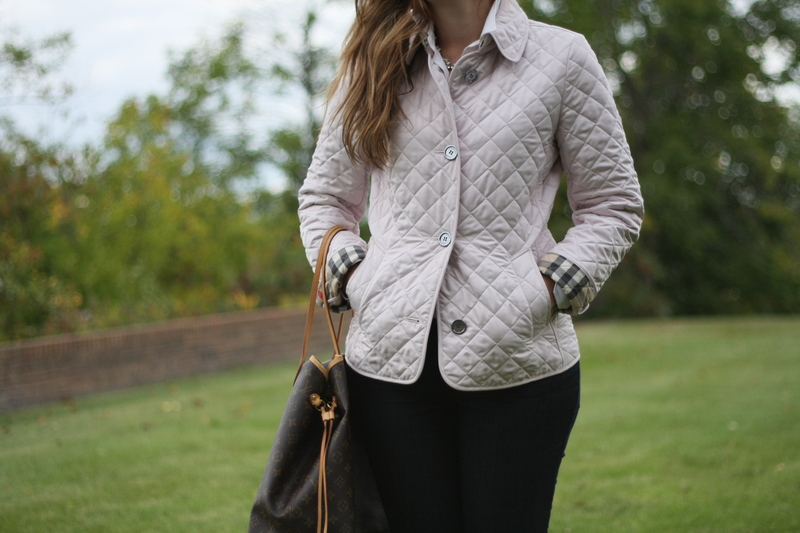 Loving the quilted coat paired with the Hunters…seems like such a classic fall look! Absolutely love quilted coats! This jacket is perfection! Loving the quilted jacket on you! I actually love the traditional “fall” weather because I just happen to love lightweight jackets like this one! This is the perfect fall outfit! I really need a quilted jacket because this one is fabulous! I love it with the Hunter boots! this quilted jacket is beyond fab! fantastic outfit! Love this classic fall look! You are so chic and stylish fashion girl! I love this look, so comfy and beautiful! Great pictures! Love this look – lusting over your hunters. I love love your coat! It has actually been on my wish list for several years. Timeless chic! Loving this classic and timeless quilted jacket. Perfect for early fall! Such a beautiful outfit! This quilted coat is such a classy! This coat is gorgeous and such a beautiful shade! I have a minor obsession (read Major) with quilted coats! Call it the equestrian in me, but there is nothing more sharp than a good quilted coat! BTW’s if this is your yard, I’m so jealous, it’s absolutely gorgeous! That coat is perfection, but will probably always be on my wish list. Love it with the Hunters!